Niagara Gazette, NY - Buffalo Niagara Brewers Association President Willard Brooks reads the name of a brewery that Mayor Paul Dyster picked as part of a Canadian and American Breweries draft on the eve of the NFL football draft. 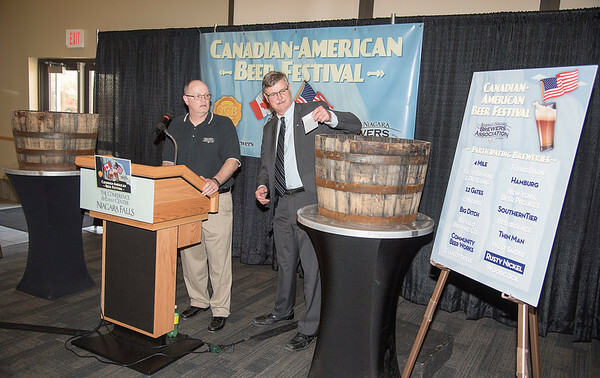 The First Can-Am Beer Festival kicks off a the Conference and Event Center Niagara Falls on April 7. American and Canadian dignitaries, including Sam Hoyt, Empire State Development; Adam Sassone, Governor Andrew M. Cuomo; Deanna Brennan, Niagara USA Chamber; Andrea Kylczek, Niagara County IDA; Neil Kavanaugh, Consumers Beverages; Andrea Czopp, Niagara Tourism and Convention Corporation; Linda Soltis, Canadian Consulate General; Chris Voccio, Greater Niagara Newspapers; Jason Murgia, Conference Center of Niagara Falls. Wednesday, April 26, 2017 at 2 p.m.
As the National Football League prepares for its annual draft on April 27th, it will be preceded by a draft to be conducted by Canadian and American craft breweries for the 2018 Canadian American Beer Festival (aka “CanAm”) that will take place in Niagara Falls, NY at The Conference and Event Center next April. Owners and representatives from 34 craft breweries from across Southern Ontario and western New York will collaborate to make craft beers for the first annual Can-Am Festival [Please see below the list of participating breweries]. Dignitaries and tourism officials will be invited to pull logos of the participating breweries from oak barrels and the breweries will be matched up on a draft board. These uniquely-made craft beers will be unveiled for the first time at the 2018 festival. 13. Rusty Nickel Brewing Co.